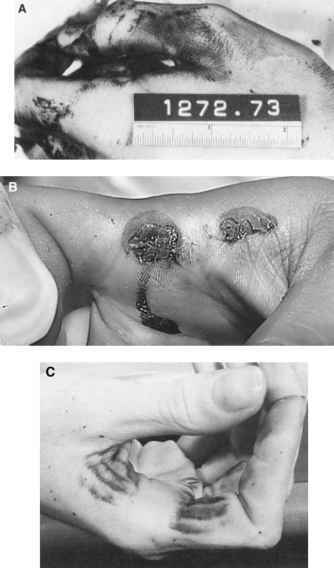 Figure 4.4 (A-B) Incomplete contact wound. loose-contact wounds making it difficult to differentiate the two. In near-contact wounds, the muzzle of the weapon is not in contact with the skin, being held a short distance away. The distance, however, is so small that the powder grains emerging from the muzzle do not have a chance to disperse and mark the skin, producing the powder tattooing that is the sine qua non of intermediate-range wounds. 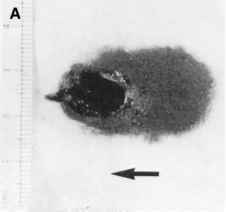 In near-contact wounds, there is an entrance wound, surrounded by a wide zone of powder soot overlying seared, blackened skin (Figure 4.5). The zone of searing is wider than that seen in a loose-contact wound. The soot in the seared zone is baked into the skin and cannot be completely wiped away. Small clumps of unburned powder may be present in the seared zones. 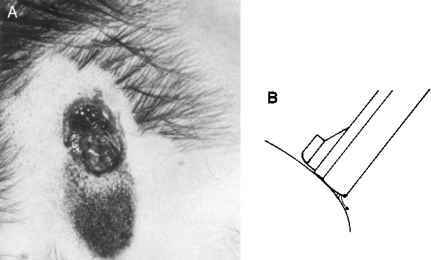 In near-contact angled wounds (Figure 4.6), just as in angled contact wounds, soot radiates outward from the muzzle creating two zones: the pear-shaped, circular, or oval blackened seared zone and the light-gray fan-shaped one. The location of the blackened seared zone to the entrance hole is different from that seen in angled contact wounds, however. In near-contact angled wounds, the bulk of the blackened, seared zone is on the same side as the muzzle, i.e., pointing toward the weapon. This is the opposite of what is found in angled contact wounds. 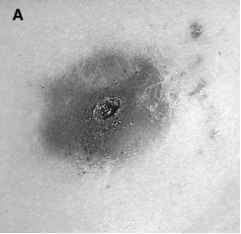 Figure 4.5 (A-B) Near-contact wound with wide zone of powder soot overlying seared blackened skin. Figure 4.6 Angled near-contact wound with blackened seared zone on same side as muzzle, i.e., pointing toward the weapon. contact wound from an angled near-contact wound. 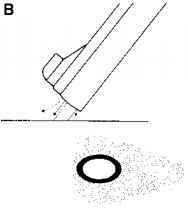 Thus, if both the bullet and the zone point in the same direction, an angled contact wound has occurred; if, however, the zone is on one side of the wound with the bullet going the other way, an angled near-contact wound has taken place. This interpretation assumes the ideal presentation of contact and near-contact angled wounds. Things are never as simple as one might wish, however. Thus, in angled contact wounds, the entrance wound should be present at the base of the seared, blackened zone. 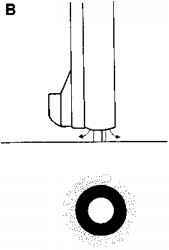 By increasing the angle between the barrel and the skin, however, this entrance will move toward the center of the zone. This same picture can also be produced by a near-contact angled wound if the distance from muzzle to target is approximately 5 mm. In such an instance one cannot always differentiate between a contact and a near-contact angled wound. When the distance from muzzle to target increases to 10 mm in near-contact angled wounds, there is usually no difficulty differentiating it from an angled contact wound. The seared, blackened zone on the side of the muzzle is much wider than it is on the opposite side. Powder grains may be seen in the seared zone on the side opposite to the muzzle.